Last week in Chicago, our board of directors meeting agenda included a special guest – 2017 FFT Fellow Paula Dell, teacher at Robert Lindblom Math and Science Academy High School in the city’s South Side. 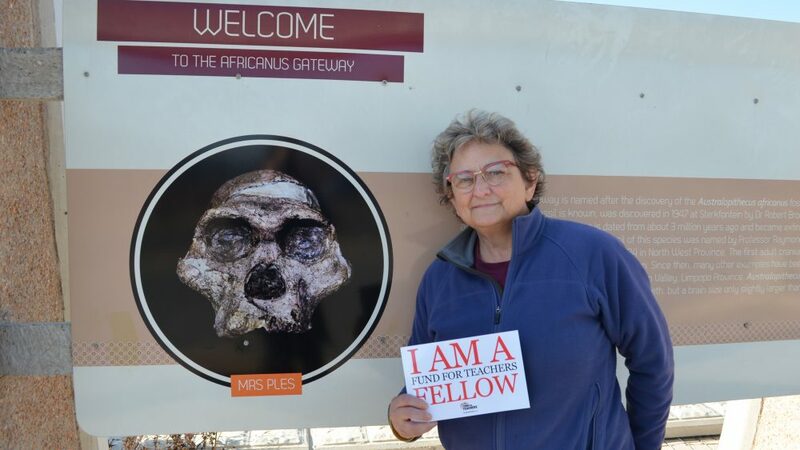 Paula used her grant to work with researchers and professors active in current excavation, research and teaching of human evolution in South Africa’s Gauteng Province – also known as the “Cradle of Human Kind.” In addition to sharing about her experiences, Paula also talked about her unique path to becoming both a teacher and an FFT Fellow. 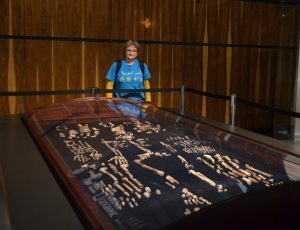 Homo naledi on display at Maropeng. The discovery of this new species has brought much into question of what we have previously thought about human development. Over the past 14 years, Paula has led student expeditions to Cuba, China and Iceland. She also researched in the Antarctica with a PolarTREC grant, earned her National Board Certification and applied for a Fund for Teachers grant three times before being awarded. “Each time I improved my proposal with the insight of Martie Sanders, professor for the School of Science Education at the University of Witwatersrand in Johannesburg,” said Paula. 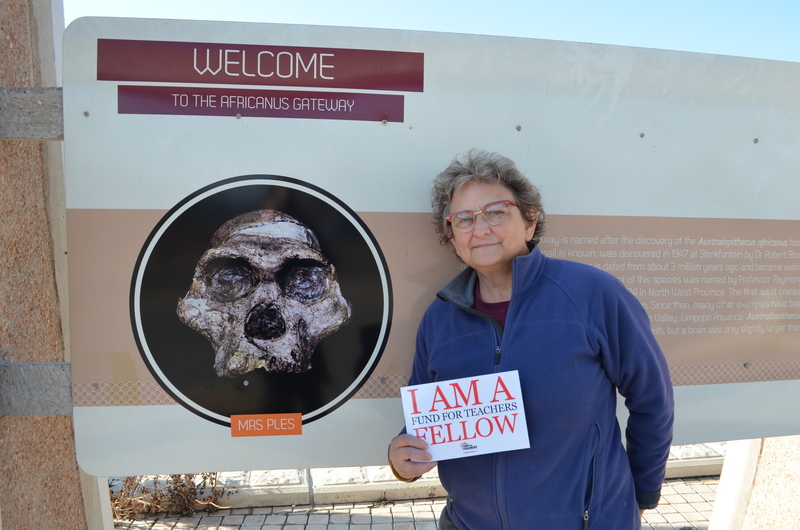 “By the time I received the FFT grant, we had been corresponding for three years!” When Paula finally arrived in South Africa, Martie introduced her to Marina Elliott, world-renowned biological anthropologist and lead researcher at the Rising Star dig. 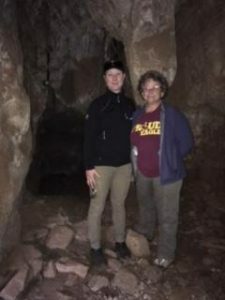 Marina spent one morning showing Paula around the excavation, including the cave where the 250,000-year-old Homo naledi was found. With Marina Elliott at Rising Star. 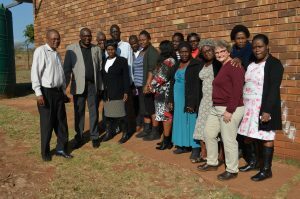 Paula with staff at the Tanajane Senior Secondary School in Bushbuck Ridge, Mpumalanga Province, after serving as a guest speaker. 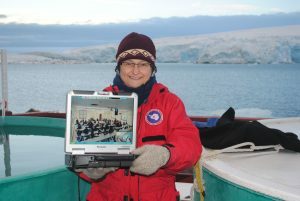 Paula (pictured Skyping with her Chicago students from Antarctica) believes that scientific exploration at all ages is crucial in understanding the world in which we live. She is a strong proponent of teaching science through inquiry, as evidenced by her students’ design of a successful underwater camera system, Fish Spy, recently deployed in Antarctica.